Following a competitive assessment process in late 2017, Nangle & Niesen Ltd were appointed by Fingal County Council to replace the magnificent Aesculus x carnea ‘Briotii’ (red chestnut) which grew in The Naul, Co Dublin. This iconic tree located in the centre of the village beside the Seamus Ennis Music Centre has been photographed since the mid-1800s and was a much-loved part of the village’s character. 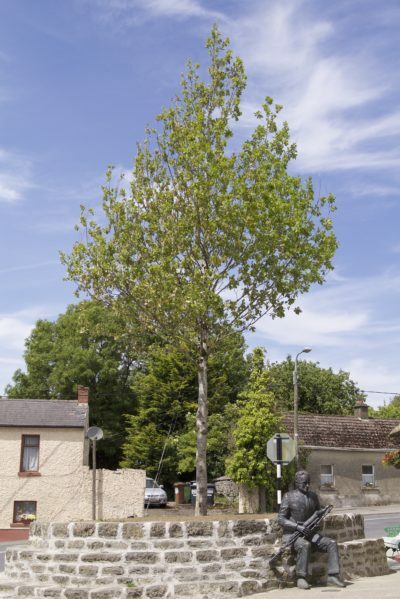 Ronan Nangle says, “The council had to remove the tree for safety reason after it became dangerous, and it was decided to replant with a 45-50cm girth specimen Quercus robur (common oak) from our nursery in Cork. In November Aileen O’Connor of Fingal County Council came to Aherla to personally select the replacement tree. It was originally planted in our fields in 1989 and has been cared for and nurtured ever since, having been transplanted five times.” On 19 December it was lifted, rootballed and delivered to the site the following day, for planting by Nangle & Niesen’s staff. A specialist soil and anchoring system were used along with a built-in watering system, and the tree was planted and secured. Having settled into its new home over the winter, the Quercus robur is now in full leaf and will provide a focal point for the people of The Naul and North County Dublin for generations to come. Ronan Nangle tells HC that it is these types of projects that keep the team enthused, and the business was proud to be involved in such a historic project. You too can have access to their expert advice at GLAS 2018. More at nangleandniesen.ie.